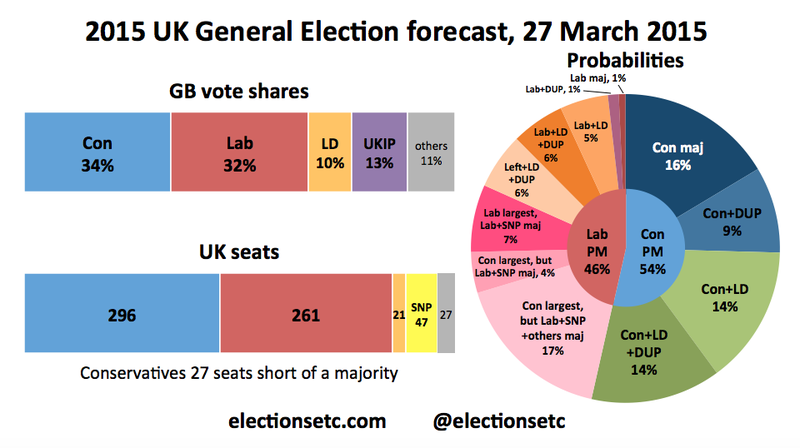 Going into the formal campaign period we’ve revised the methodology for the ElectionsEtc.com general election forecast. For the GB share of the vote forecast we are still using the same method we have been for over a year (described in this working paper). The main idea is to look at historical election results and polls and estimate how best to use opinion polls to predict future election results. Our small predicted rise in the Tory vote and corresponding 1-point drop for Labour are primarily due to this historical average pro-Labour polling bias. Further out from the election we were also forecasting government recovery and opposition setback effects. Now we are so close to the election — and because both Labour and the Conservatives are polling not far from their 2010 vote shares — there is little historical reason to expect much swing back for either of the two main parties. By contrast, the Liberal Democrats are predicted to recover a bit and UKIP fall back somewhat by the time of the election because their polling figures are still dramatically different from their 2010 levels. The changes in Scotland are still more dramatic, with the polls showing around a 20-point swing from Labour to the SNP. We don’t have enough historical Scotland-only polls to apply similar models, but we have thus far used a swing-back adjustment estimated from GB models. We are now weakening that assumption, mainly because the changes in Scotland much more structural than simply part of an electoral cycle effect. The major methodological change we have made going into the campaign is to model between constituency variation. This is done using Ashcroft constituency polls and individual-level data with constituency identifiers kindly provided by YouGov. The approach is similar to that used for modelling exit poll data, i.e. model the change since 2010 at the constituency level. This has been done for Scotland separately from England and Wales and precedence given to evidence consistent between both the Ashcroft and YouGov data. The main constituency level patterns that make a noticeable difference to our seats forecast are Scottish Labour falling further where they started stronger and first-time incumbent Conservative MPs doing better. The former helps the SNP and the latter the Tories, while both hurt the forecast number of Labour seats. The result is a 35-seat lead for the Conservatives, but still a tally that leaves them well short of a majority. This makes the chances of a Conservative-led government much greater, with a 54% chance of David Cameron remaining as Prime Minister. But the chances that the Tories will get the most seats is greater still. At 74%, it now matches the chances that they will get the most votes. This means that if we are right about the pattern and extent of the constituency variation, there will be practically no electoral-system bias at the election. We have changed the schema for the governing majorities pie chart to reflect the fact that the SNP have repeatedly promised that they would definitely vote against a Tory Queen’s speech to lock them out of government. The chart shows probabilities assuming Labour will try to govern without the SNP if it can get a majority with the Liberal Democrats and/or DUP and assuming that Labour and the SNP will be able to do enough of a deal for government to continue for a while if Labour does depend on the SNP. One thing that hasn’t changed since last week is the polling average going into all this. Conservatives and Labour are still neck-and-neck on 33% which means that there hasn’t been an budget bounce. Could you supply the decimal place in the predicted vote share please? I’ve been watching the trend over time and this is lost in rounding to the nearest whole. It is a pity you do not show predictions for the other parties in Scotland. Clearly the outcome in Scotland will affect the UK outcome. John Curtice’s last poll of polls for Scotland had CON 16% LIB/DEM 4% UKIP 4% Green 3%. How the other parties perform, particularly the Conservatives and Lib/Dems, will affect the final result in Labour and Lib/Dem seats where the outcome in many constituencies is likely to show a narrow margin between 1st and 2nd placed candidates. A late, but usually small recovery for the government party is normal in the final days. This is what makes Scotland even more interesting because the Government party is the SNP. As I have argued before, what we are seeing in both post 2010 elections and long run polling for Scotland is an alignment in party preference with results for the Scottish Parliament and other elections. B: people think its beyond the points of any help, thus it donsn’t matter who their vote for. Good! I think you will be closer to the actual May results (by showing the Conservative with a 35 seats lead over Labour) in your predictions, than many forecasters! Especially as they do not appear to be adjusting the anticipated Labour seat tally to allow for large numbers of losses in Scotland. It was interesting to note that a quickie poll after the Sky/Paxman interviews, where Cameron and Miliband were grilled, gave Cameron 54% to Miliband’s 46% That, ironically, in my opinion, is going to be nearer to the Conservative lead (over Labour) in the May popular vote than the current raft of opinion polls would have us believe. I would agree. The polls don’t genuinely reflect the public’s strong repulsion towards Miliband. I expect the next government to be a Conservative-LibDem-DUP coalition. You predict a smaller Tory lead over Labour this week compared to last week, but a much bigger Tory lead in seats. I don’t find this at all credible.